Systemic onset juvenile idiopathic arthritis (SOJIA) can be associated with proteinuria due to various renal pathologies. We report two pediatric cases with SOJIA and nephrotic syndrome secondary to renal amyloidosis, a very rare complication in children. Once present, amyloidosis heralds a poor prognosis for the patient, though early detection may allow some improvement if the inflammatory arthritis is controlled. Nephrotic range proteinuria and nephrotic syndrome in the setting of chronic inflammatory arthritis should raise the possibility of renal amyloidosis. Renal amyloidosis in patients with systemic onset juvenile idiopathic arthritis (SOJIA) has been reported infrequently, especially in the Indian setting.,, We report two children with SOJIA who presented with proteinuria, the first patient presented with classic nephrotic edema and the other who had nephrotic range proteinuria but no edema. Both were found to have renal amyloid-A (AA) amyloidosis on biopsy. A 14-year-old boy, diagnosed with SOJIA at six years of age presented in October 2013 with generalized edema for one month with increasing severity. As a result of irregular follow-up and periods of noncompliance, his arthritis had never been adequately controlled. On examination, the patient’s weight and height were both below the 3rd percentile for age. His blood pressure was normal. He had pallor, bilateral periorbital puffiness, pitting pedal edema, and ascites. Chronic deforming arthritis of various large and small joints was noted. He had no clinical evidence of heart failure or liver disease. Urine routine examination showed 3+ albumin with no red blood cell (RBC) or white blood cell (WBC). Subsequent evaluation revealed nephrotic range proteinuria, serum albumin 0.9 g/dL (normal range 3.5–5.5 g/dL), and serum cholesterol 297 mg/dL (normal <200 mg/dL). Renal function (serum creatinine 0.3 mg/dL) was normal. Serum complement levels were normal and antinuclear antibody (ANA) was negative. A 13-year-old boy with a history of SOJIA for 10 years was referred for the evaluation of proteinuria detected during a screening urine examination by his pediatrician in April 2014. The patient had been treated with naproxen, oral methotrexate, and prednisolone in the past with the history of noncompliance and recurrent flares of arthritis. Recently, his urine showed 3+ albumin at a regular visit. There was no history of edema, gross hematuria, or reduced urine output. On examination, the patient’s height and weight were at the 5th percentile. His blood pressure was normal. The patient had no edema. There was polyarticular symmetrical arthritis of large and small joints. Laboratory investigations revealed 3+ albumin in urine with no RBCs and WBCs. 24-h urine protein was 2.5 g (nephrotic range proteinuria). Serum albumin was low (1.7 g/dL) and cholesterol was elevated (279 mg/dL). Renal function (serum creatinine 0.6 mg/dL) was normal. Serum complement levels were normal, and ANA was negative. A diagnostic kidney biopsy was performed for both cases to determine the cause for the nephrotic syndrome. Findings were similar in both cases showing acellular amorphous material staining positive with Congo red and demonstrating apple-green birefringence suggestive of amyloid deposits in the mesangium, tubules, and interstitium. Otherwise, glomeruli were unremarkable [Figure 1]. In addition, this material stained positive by immunoperoxidase AA stain confirming secondary amyloidosis. Figure 1: Periodic acid–Schiff (1) and methenamine silver negative amorphous material in the peritubular region (arrow). Normal tubular morphology (2). This material is Congo red positive (3) (star), giving an apple-green birefringence under polarized light (4) (arrow). Proteinuria in children with juvenile idiopathic arthritis (JIA) is commonly due to use of nonsteroidal anti-inflammatory drugs and antirheumatoid drugs such as gold and penicillamine. Focal mesangial proliferative glomerulonephritis, membranous nephropathy, and rheumatoid vasculitis secondary to SOJIA are rare. In addition, patients who have long-standing, poorly controlled inflammatory arthritis may develop AA (secondary) amyloidosis. 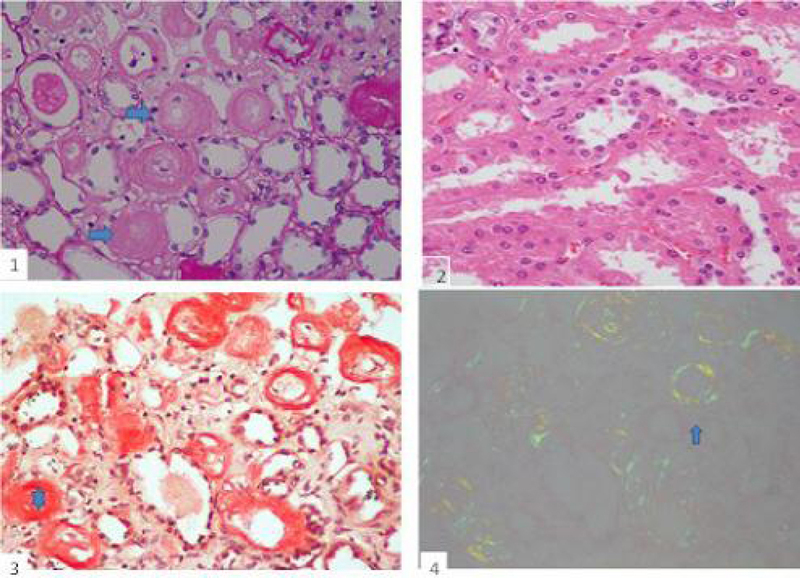 The reported prevalence of secondary AA amyloidosis in JIA varies from 1% to 10%. However, the prevalence in children in the setting of a developing country is unknown.,, Given that noncompliance and irregular follow-up occurs quite commonly in our setting, one might assume that secondary amyloidosis occurs more frequently than in the Western world. We report two children seen within seven months with SOJIA and proteinuria. Amyloidosis is more likely to occur in poorly controlled, severe, long-standing disease as seen in both of our patients. The kidney is the most affected organ in secondary AA amyloidosis. Renal involvement dominates the clinical course and adversely affects survival. In a Finnish series of renal amyloidosis, the mortality rate was 42%, and chronic renal insufficiency was present in 25% of survivors after a mean follow-up of 15 years. The diagnosis is confirmed by the light microscopic appearance of amyloid, an amorphous eosinophilic material that stains red with Congo red. Under polarized light, the deposits have a characteristic apple-green birefringence. Glomerular sclerosis and interstitial fibrosis suggest advanced disease and are markers of poor prognosis. Regular screening for proteinuria in children with JIA and SOJIA might detect renal amyloidosis early as asymptomatic proteinuria is the most common initial presentation of kidney disease. Aggressive anti-inflammatory therapy could then hope to control or even reverse the amyloidosis as recently reported with tumor necrosis factor alpha inhibitors (infliximab and etanercept) and anti-IL-6 receptor antibody tocilizumab. As a result of the early diagnosis, our second patient was started on therapy with tocilizumab in an attempt to reverse his renal amyloidosis. After three doses, however, he continues to be proteinuric. We intend to treat with a total of 6 doses, though the family has expressed difficulty with paying for the tocilizumab. We recommend that all children with JIA should be monitored for persistent proteinuria. Although the benefits of tocilizumab in treating amyloidosis in SOJIA have been reported, it will remain out of the reach of many patients due to its cost. Fabrizio D, Rayfel S. Systemic juvenile idiopathic arthritis. In Cassidy JT, Petty RE, Laxer RM, Lindsley CB, eds. Textbook of Pediatric Rheumatology. 6th ed. Philadelphia: Saunders; 2011. p. 242-3. Duarte C, Gomes C, Correia AJ, Salgado M. Renal amyloidosis: An uncommon complication of juvenile idiopathic arthritis. Clin Rheumatol 2006;25:548-9. Saha A, Chopra Y, Theis JD, Vrana JA, Sethi S. AA amyloidosis associated with systemiconset juvenile idiopathic arthritis. Am J Kidney Dis 2013;62:834-8. Helin HJ, Korpela MM, Mustonen JT, Pasternack AI. Renal biopsy findings and clinicopathologic correlations in rheumatoid arthritis. Arthritis Rheum 1995;38:242-7. David J, Vouyiouka O, Ansell BM, Hall A, Woo P. Amyloidosis in juvenile chronic arthritis: A morbidity and mortality study. Clin Exp Rheumatol 1993;11:85-90. Jha V, Chugh S, Gupta KL, Joshi K, Sakhuja V. AA amyloidosis associated with systemiconset juvenile idiopathic arthritis. J Assoc Physicians India 1993;41:117-9. Sarkar B, Singh S, Suri M, Kumar L. AA amyloidosis associated with systemic-onset juvenile idiopathic arthritis. Indian Pediatr 1996;33:125-7. Bilginer Y, Akpolat T, Ozen S. Renal amyloidosis in children. Pediatr Nephrol 2011; 26:1215-27. Immonen K, Savolainen A, Kautiainen H, Hakala M. Longterm outcome of amyloidosis associated with juvenile idiopathic arthritis. J Rheumatol 2008;35:907-12. Gottenberg JE, Merle-Vincent F, Bentaberry F, et al. Anti-tumor necrosis factor alpha therapy in fifteen patients with AA amyloidosis secondary to inflammatory arthritides: A followup report of tolerability and efficacy. Arthritis Rheum 2003;48:2019-24. Okuda Y, Takasugi K. Successful use of a humanized anti-interleukin-6 receptor antibody, tocilizumab, to treat amyloid A amyloidosis complicating juvenile idiopathic arthritis. Arthritis Rheum 2006;54:2997-3000.